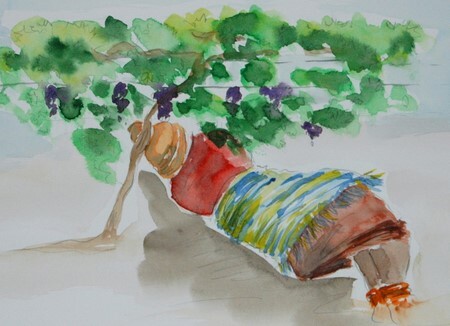 The first two sketches – pencil and watercolor on hotpressed Fabriano paper. 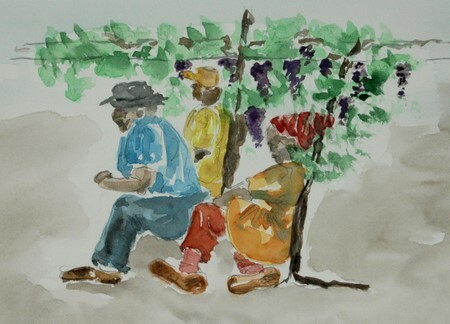 The last three – ink and wash on rough Canson paper, which I am quite happy with – it gives a feel of the roughness of the day and the job…grape picking isn’t so romantic when the heat comes down on your shoulders at about 35 degrees C.
As for the light – it was in the middle of the day and far too white to be spectacular. I really enjoyed this day of drawing. The Cape folk are so easy to get along with – they take life in their stride, aren’t afraid to laugh, to joke, to talk, to differ and their wit has no equal! They were on lunch break and didn’t mind at all that I sketched them while they were taking naps. In fact, they ganged up behind me, looking to see who the next one was to be sketched, making suggestions, made jokes, even gave advice. I shared in their lunches and drinks, but unfortunately couldn’t share in the napping…would’ve liked to though!! 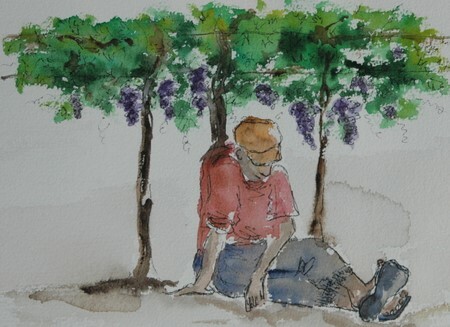 I hope I did capture some romance in these napping in the shade of the vines…. THanks for sharing all this wonderful sun and relaxation. I really get it from this post, pictures and text! I just love these Ronell – thanks for sharing a little bit of your vacation with us! The colors are beautiful – well done! These just carried me away- what a great job with the colors, and the people’s positions are really believable- well done! These are great. From your colors it looks like it was really hot–no wonder everyone was taking siestas. Thank you for the nice comments…much appreciated. Your sketches are so beautiful! 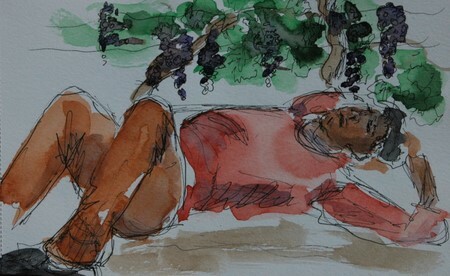 You really got the postures of the people down so well that you can actually feel them napping.